"In southern Appalachia, the wild grapes are muscadines, foxes, possums, and scuppernogs." I picked these Concord grapes from vines my in-laws planted nearly 35 years ago. Just imagine how many jars of jelly and juice those vines have produced over the years! It is still a popular grazing spot for everyone in the family. One for me, one for the basket, two for me, one for the basket...you get the idea. Heat your clean jars, lids, and rings. Boil a big pot of water. Fill each jar with boiling water leaving a half inch space at the top. Wipe rims with a clean towel and place hot lids and rings on jars. Swish the jars a little to help the sugar dissolve. Process the jars in a water bath (at a rolling boil) for 20 minutes. Carefully remove the jars and place on a towel. Allow to cool and seal for 12-24 hours before moving to storage. *You can adjust the amount of sugar. I've seen other recipes that use as little as 1/4 cup and as much as 3/4 cup. Allow the juice to sit for about two months so everything can blend. I'm not a patient person so I decided to open a jar tonight after waiting one whole month. I should get an award! I'm surprised that I was able to make it that long. I noticed that it had developed a deeper color and know that it'll darken up the longer it sits. I drained mine through a mesh strainer into another jar and store it in the fridge. It is great! 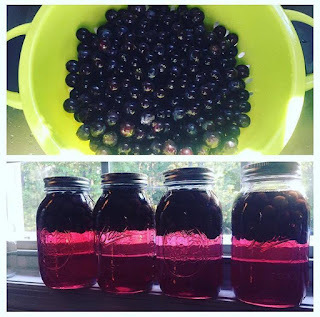 I believe that you would be hard pressed to find a simpler recipe for grape juice. Fun Fact: If someone in your house comes down with the stomach bug, start drinking as much grape juice as you can. It is supposed to change the pH in you intestinal tract and have enough vitamins and antioxidants to fight off the germs. If you are already having symptoms, it's too late. Not even grape juice can save you now. Please let me know if you give this recipe a try and how you like it! Phrases Of Appalachia: Are you peart?